Alt-text: Ties are broken by whoever was closest to the surface of Europa when they were born. I think we can get by with only a 28-round tournament, given that we exclude everyone under the age of 35. Also, I hope I get a first-round bye. My thought: just skip #2 through #7. I think #18 may be an issue, as some of that line have had a lot of issue and which issue took precedence has often been an issue. Is that only the current monarch and her descendants or would her sister's descendants and her father's siblings' descendants and her grandfather's siblings' descendants count? What about previous royal families who had the throne (and in some cases their heads) taken from them by force? What about the ones who are under 35? Would someone else occupy the Oval Office as Regent until they reached that age? Why isn't Malala Yousafzai on the list? What, no Giant Meteor? He had pretty good numbers in the last election. eidako wrote: What, no Giant Meteor? He had pretty good numbers in the last election. That's only because he chose Deez Nuts as his running mate. Sableagle wrote: Why isn't Malala Yousafzai on the list? She's under 35 and not native to the United States, so she's only eligible if she takes up tennis and beats Serena Williams at exactly the right time. Where's Zaphod Beeblebrox when you need him? Wot no "Harrison Ford", "Anybody else who has played Jack Ryan (except Ben Affleck)", "Meg Ryan", "oh, go on then, Ben Affleck as well"? I suggest you insert replace these as the positions 1…4. With immediate effect. Oh, come on already. How could Randall have left out Colossus ? Or these days, I suppose some self-replicating AI? Jennifer Connelly, in character as Maddy Bowen, should also be on this list. She should be higher up the list than Tom Hanks. I don't think there are any of those that satisfy the "Natural Born Citizen" requirement. Make that skipping #1 through #7 and put Nathan Fillion in the Veep slot, and we'll have a deal. RECOMMENDATION: A reordering of the Presidential line of succession to: Vice President, Secretary of State, Secretary of the Treasury, Secretary of Defense, Attorney General, followed by four or five newly appointed individuals residing outside of Washington, D.C.
Oh yeah... that'll be easy. Though probably easier than picking legal guardians for your kids in your will. somitomi wrote: Where's Zaphod Beeblebrox when you need him? He's too busy "running" the entire universe. Oh, so he is in fact already the president of the US, since that's part of the galaxy. pkcommando wrote: Then the Nathan's Hot Dog Eating Champion. That title clearly deserves a much higher spot on the list. dtilque wrote: ETA: more thoughts: add billionaires who own their own spaceship company immediately after #8. We've already tried having an egomaniacal billionaire who believes racist conspiracy theories about the media. It's not working out so great. A more serious question is what percentage of the population can you lose before the official line of succession becomes moot since either the US ceases to exist as a meaningful entity, or the survivors have their own ideas about who they choose to follow? #18 seems a bit risky. All it would take is one careless followup proposal to throw the whole process into endless recursion! I checked. She's old enough! Not yet found a valid running mate, though. Actually #18 isn't that much, as of 2011 it only consisted of 5753 individuals according to http://www.wargs.com/essays/succession/2011.html. The line of succession is limited to non-Catholic descendants of Electress Sophia of Hannover. If this line ever dies out, its not clear what would happen then. I wonder how many, if any, of those 5753 are natural-born citizens of the United States. If she starts training hard now she'll have a decent chance in about twenty years. Also, what do we do if Tom Hanks gets embroiled in a sexual harassment scandal? Oh, wait, I forgot that it's only a problem for entertainers. Add Stormy Daniels to the list. Mikeski wrote: I think we can get by with only a 28-round tournament, given that we exclude everyone under the age of 35. Also, I hope I get a first-round bye. I did the calculations and got only 0.5 people after the 29th round. Then realized that the US population was probably much bigger than when I last checked. Still only 9/10ths of a President. Which is better than nothing. Wikipedia has the US population at "327,589,916 as of April 23, 2018". That same article has 13% as foreign-born immigrants, and 52.8% as 35 years old or older. A single-elimination tournament of N rounds supports 2^N participants. So 28 rounds is about right, allowing 268+ million participants. 27 would only handle 134+ million. Randall's 29-rounder of 536+ million is enough for everyone, eligible or not: foreigners, infants, Bill Clinton, etc. My father-in-law Charlie Phelps is a pretty sharp guy. He turns 100 this month. He should be on the list, and everyone under 100 taken off it. OTOH, if we raise the age requirement to 110, we will probably get our first female president. Probably lots of them in quick succession, because they die like files at that age. They will all handle the job better than the Current and the Recent Previous Occupants. If he does mean Joust the game, I'm in with a shout. Should make the semi-finals, at the very least. Riding a horse is easy. Falling off it without dying, that's the hard part. Half of them do. And it's not like there aren't lots of others on the list that don't qualify by that requirement. Especially #18.
gmalivuk wrote: We've already tried having an egomaniacal billionaire who believes racist conspiracy theories about the media. It's not working out so great. OK, we got one rotten apple. And there's other billionaires I wouldn't vote for either, or for that matter, walk across the street to piss on them if they were on fire. But none are in the spaceship group. From a european perspective, I really wonder why the simple solution of just scheduling a new election seems completely unthinkable to you US guys? Your 4-year term seems really written in rock. I was talking specifically about Elon Musk. herbstschweigen wrote: From a european perspective, I really wonder why the simple solution of just scheduling a new election seems completely unthinkable to you US guys? Your 4-year term seems really written in rock. Not rock, just a particular piece of paper that some people get very twitchy about if you start talking about changing it. Geoff Bezos isn't a real person (or at least isn't a billionaire), and Jeff Bezos would also make a terrible president, though I suppose he might not buy into antisemitic conspiracy theories about the media like Musk and Trump both do. As far as I know Burt Rutan is also not a billionaire. Every ten years there should be a census taken of all persons living in the United States. There should be one question: "Do you know this person? ", applied to each and every other person in the country. The results would be tallied into a national notoriety score. 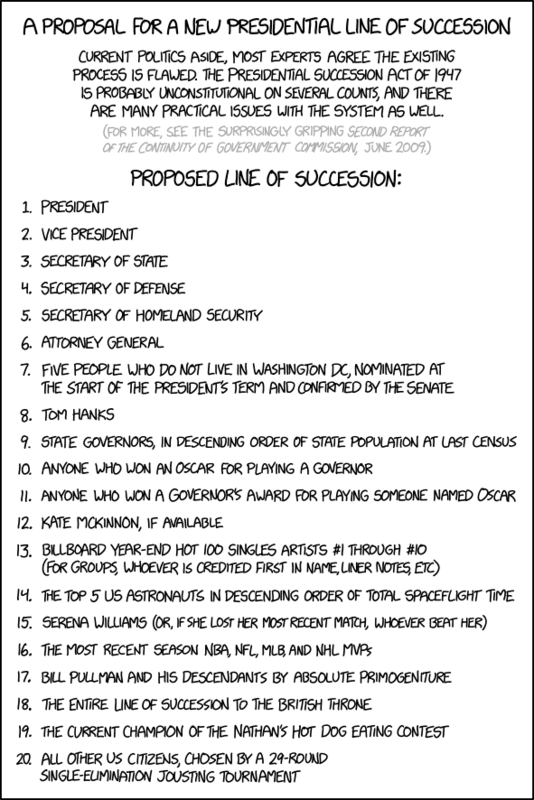 The presidential succession chart would be made up of this list, in reverse order. Ties to be determined by fistfight - the loser becomes president. Burt Rutan retired, although presumably after completing Space Ship One and White Knight. And of course he is nowhere near a billionaire. I've heard of people who were expected to have the whole succession memorized (out to 50 or so people). I'm sure this was a Cold War thing, and might have been something expected in Basic Training. I never had to learn such things: neither in class (which involved all sorts of Constitutional trivia and procedural rules that included all the "official" ways laws are passed without delving into the reality of lobbyists and staffers), nor in boy scouts (which would be just the thing for that. Especially thanks to "be prepared" and all that). Perhaps by the 1980s it was clear that while nuclear war was a strong possibility (Reagan didn't seem to build a weapon system not specifically designed to "win" a nuclear war, especially when it could replace a weapon that could merely "tie" one, making a Russian first strike a growing logical outcome to force a "tie"), but I doubt many had any delusions of the United States Government surviving such a war (and certainly not many of the people).